It pays to be careful about what we do not like. The phrase “judge not lest you be judged,” was not designed to reduce us to complete silence or to idiocy. Further, we know not the day nor the hour, but we should be prepared. Our lives are “purposeful.” They are not given to us just so that we can pass the time of day waiting for something to happen. We already have people stuck working to man the airports and restaurants. We shouldn’t be asking even more people to work, particularly when shopping (thankfully!) isn’t even part of our Thanksgiving tradition, unlike traveling to be with family or enjoying a meal together. […] For many of us, our workweeks are Monday through Friday. […] But if you work retail or other jobs that involve regular weekends and nights — and many of your friends and family do — it’s tougher to get everyone together. It’s hard to find a day when everyone is off and can gather together. It used to be that holidays were those days: A time when just about everyone, regardless of his job, was able to spend the day with loved ones. Making Thanksgiving a working day is going to change that. It’s going to take away from retail employees a rare universal day off. And frankly, I can’t imagine what you could buy on Thanksgiving that would make that trade-off worth it to our culture. 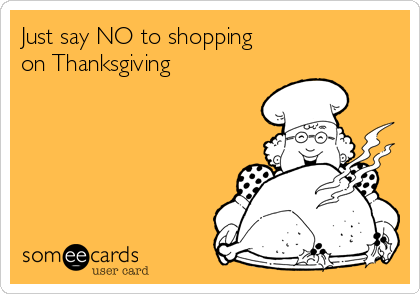 via Nobody Should Go Shopping on Thanksgiving | National Review Online. Are you really calling for schism, Tony Jones? take note of those who create dissensions and difficulties, in opposition to the doctrine which you have been taught; avoid them. For such persons do not serve our Lord Christ, but their own appetites, and by fair and flattering words they deceive the hearts of the simple-minded. I am reminded of someone like G. K. Chesterton, who is often thought of as a “conservative’s conservative,” but who instead of contenting himself with denouncing socialism and defending what is good about markets, pushed himself to make key contributions to the rich (and underexploited) Catholic school of distributism. I often think of someone like the Servant of God Dorothy Day, Obl.OSB. If she saw a list of the economic policies I support, she would probably be horrified. But I find myself very often enriched by her radical critique of the state, her trust in bottom-up forms of economic organization, and her keen awareness of what is often the reality of economic exploitation. There is a place for discernment, and for advocacy, and even for confrontation. But I think that as Catholics we are also called upon to take the Pope’s message seriously, humbly, and to let it challenge us and to incorporate it into our own thinking, under the guidance of the Holy Spirit. For this I’ll pray. via Let’s Listen to Pope Francis on Economics | First Things. The priesthood belongs to all the saints! They sometimes call you laity, but the Holy Spirit says of all the saints, “You are God’s cleros”—you are God’s clergy. Every child of God is a clergyman or a clergywoman. There are no priestly distinctions known in Scripture. Away with them! Away with them forever! The Prayer Book says, “Then shall the priest say.” What a pity that word was ever left there. The very word, “priest,” has such a smell of the sulfur of Rome about it, that so long as it remains, the Church of England will give forth an ill savor. The perfect storm upon us is that all this is tied to bad moral teaching, like the notion of a “fundamental option,” which both John Paul II and Benedict tried to overcome. And we’re now at the point of believing in universalism of salvation on both the theoretical and practical level. The corrupting power of the “fundamental option” is that almost no sin can change it, once that option is directed to God. So contraception does not alter my fast track to heaven, nor does abortion, homosexuality, and any perversion you can think of, not even murder, genocide, and so forth. None of these things matters in the end. Like the popularized fundamental option approach to moral living, the notion of universal salvation deeply undercuts any real effort at moral reform in the Church. It rather easily convinces people that it really doesn’t matter how one lives, so long as one is kind to others and trusts in a merciful God. via The Perfect Ecclesial Storm. via The Unknown Citizen- Poets.org – Poetry, Poems, Bios & More. In a world often dominated by ‘individualism and subjectivism,’ he said, many people — including many Catholics — say that God will forgive their sins and they have no need of the sacrament of confession and the ministry of a priest. via CNS STORY: Pope, at audience, says he goes to confession every two weeks. 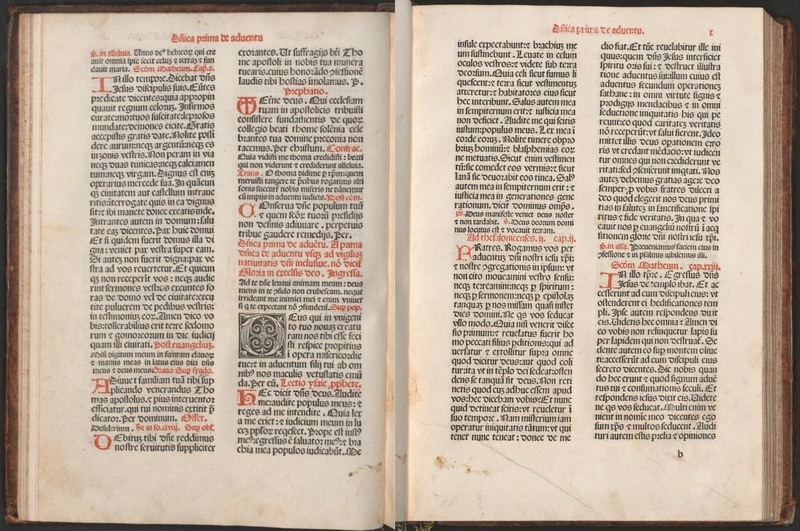 Is the Ambrosian Lectionary an Older Form of the Traditional Roman Lectionary? The principal, and to my mind, insuperable objection to Msgr. Ceriani’s theory is as follows. Supposing that the Milanese liturgy did come from Rome, and is, as Bl. Ildephonse Schuster once said, more Roman in origin than the current Roman Rite itself: when and why did it begin to consistently reject all subsequent changes made to the Roman Rite, changes which are manifestly not “secondary”, when they were accepted by absolutely everyone else who used that rite? A host of similar objections might also be raised, such as the completely different chant, and the radically different structure of the Divine Office. 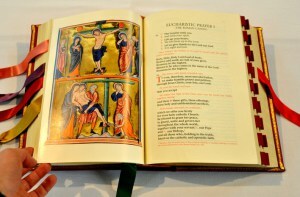 via New Liturgical Movement: Is the Ambrosian Lectionary an Older Form of the Traditional Roman Lectionary?. There is a boys’ boarding school in northeast Pennsylvania that takes such observations to heart. Students at Gregory the Great Academy are required to embrace a life of “technological poverty,” which means relinquishing cell phones, iPods, computers, and the like; arriving at school with only the essentials for a “disconnected” life. The pedagogy at work here is simply to free students from distraction and to allow them to focus on the important things in life: growth in virtue, cultivation of friendship, and contemplation of the Divine. Any infringement of this policy—this way of life—results in severe repercussion, if not expulsion. via A School Without Screens | Crisis Magazine. via Pope Francis on “progressives” | Fr. Z’s Blog. via The Continuity of Virtue. Feast! is the book we wish we had when we first started observing the Christian Year. It is 125 pages of real food to celebrate the liturgical year and lives of the saints and reflections on the seasons of the Christian calendar and simple traditions. Feast! features 23 simple real food recipes for the liturgical seasons of Advent, Christmas, Epiphany, Lent, and Easter, and well-known saints’ days like St. George’s Day, St. Rose of Lima’s Day, and St. Thomas Aquinas’ Day as well as less familiar saints like St. Charles Lwanga and St. Raymond Nonnatus. via Our Book! It’s Here! It’s Finally Here!. Protector in te sperantium, Deus, sine quo nihil est validum, nihil sanctum: multiplica super nos misericordiam tuam, ut, te rectore, te duce, sic transeamus per bona temporalia, ut non amittamus æterna. Per Dominum Nostrum I.C. O God, the protector of all that trust in thee, without whom nothing is strong, nothing is holy; Increase and multiply upon us thy mercy; that, thou being our ruler and guide, we may so pass through things temporal, that we finally lose not the things eternal: Grant this, O heavenly Father, for Jesus Christ’s sake our Lord. Amen. To us who live in a grossly materialist culture, which rates people’s value by their earning and spending power, and assesses human happiness by the possession of good things, it is difficult to imagine a more salutary and necessary emphasis. via Just passing through | Curlew River. so that in the time of mercy I may receive you again with them. via Wednesday of the Thirty-third Week in Ordinary Time.